It’s Sunday at Augusta National, and Anchorage golfer Ian Bruchhauser lines up a putt on the 18th hole. The nerves he battled all day have finally given way to the sheer joy of standing on a perfectly manicured green on one of golf’s most treasured courses. It wasn’t the Masters, but rather the week leading up to the prestigious tournament scheduled to wrap up Sunday. Bruchhauser, a 15-year-old self-taught golfer, used clutch chipping and putting to capture third place in his age-group at the national finals of the Drive, Chip and Putt contest last Sunday at Augusta National Golf Course in Augusta, Georgia. He didn’t win a green jacket, but he received a trophy from a man wearing one — Sergio Garcia, the 2017 Masters champion. “He’s my mom’s favorite golfer, so it was kind of special getting it from him,” Bruchhauser said. Everything about the week was special for Bruchhauser, who got hooked on golf as a little boy when mom Michele Bruchhauser bought him a set of plastic golf clubs. He honed his skills by putting in the living room, chipping in the garage and swinging anywhere there was enough room, and in September he won the Drive, Chip and Putt regional championship at Washington’s Chamber Bay golf course. 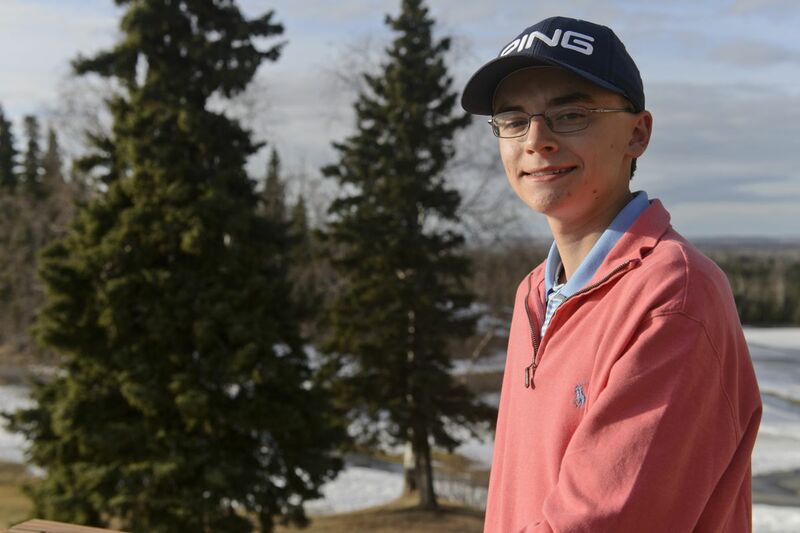 That victory made Bruchhauser the first Alaskan to qualify for the national finals at the famed Augusta course, where he arrived with no expectations other than to soak up the scene. He did that, and more. He attended a Saturday night banquet along with former Secretary of State Condoleeza Rice, Augusta National chairman Fred Ridley and several Golf Channel announcers. He attended Monday’s practice round and got Tiger Woods’ autograph as Woods was leaving the practice range. He got autographs from Bubba Watson, Adam Scott, Patrick Reed and a few others, too. He saw Tom Watson. And during Sunday’s Drive, Chip and Putt finals, he rallied from seventh place after the driving competition to place second in chipping and third in putting. He finished third overall with 21 points, five points out of first place, one point out of second place and three points ahead of fourth place in the 10-boy finals. Until this school year, when he and his mom temporarily moved to California so he could play high school golf and improve his chances of earning a college scholarship, Bruchhauser had never had a golf coach. He’s never had a private lesson or a series of group lessons. Once he reached the regional level of the Drive, Chip and Putt competition, he went up against kids who play year-round with private coaches. Bruchhauser qualified for the national finals in his last year of eligibility for the age-group competition. It rained on the day he competed, but he said the course was spectacular even on a misty, overcast day. The driving and chipping portion of the competition was held on the practice range and the practice green, and then golfers moved to the 18th green for the putting competition.